As Lydia Burnett traversed the fairgrounds, several people approached to say hello and offer hugs, filling the summer afternoon with ever more warmth. EATON — Lydia Burnett’s face totally lit up two times when we were talking – first at the mention of county fair pork chops and second when she talked about her new grandchild. 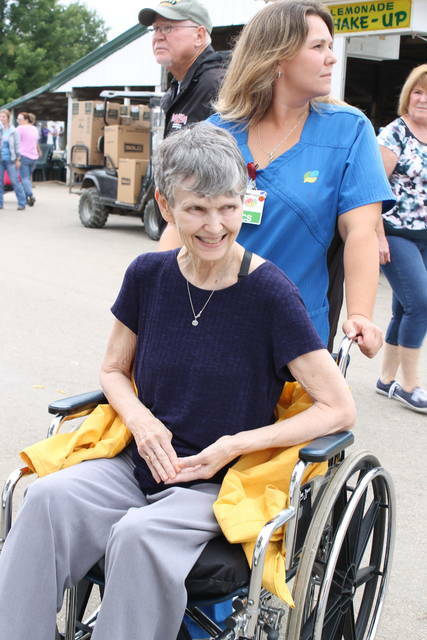 Burnett, a resident at Vancrest of Eaton and patient of Ohio’s Hospice of Dayton, was included in a group of Vancrest visitors to the Preble County Fair. The fairgrounds were familiar territory for Lydia, who entered her home-sewn creations in 4H competitions and whose family farm included bee hives that produced honey to be sold at the fair. Asked to name her favorite fair food, Lydia without hesitation cited “pork chops.” So her hospice team ensured she was treated to one for lunch. Burnett’s fair tour also included the antique display, games and animal barns. Before her illness advanced, Burnett enjoyed boating and fishing, and proudly recalled catching a champion-sized pike while vacationing in Canada. Her newest source of pride is her new granddaughter, born this summer to Lydia’s son, Todd, and his wife. Lydia is also proud grandma to their 7-year-old son. As Burnett traversed the fairgrounds, several people approached to say hello and offer hugs, filling the summer afternoon with ever more warmth. For Lydia’s caregivers, nothing could be sweeter than getting to share a county fair outing with her to watch her smiles. https://www.registerherald.com/wp-content/uploads/sites/41/2018/09/web1_Lydia-2_ne201892101939163.jpgAs Lydia Burnett traversed the fairgrounds, several people approached to say hello and offer hugs, filling the summer afternoon with ever more warmth.